Catalonia’s southern region is often overlooked in favour of its better-known northern towns and tourism hotspots. But with the fine sandy beaches of the Costa Daurada, the historical footprints left by the river Ebro, and a wealth of wine tourism (or all of the above), a trip to the south shouldn’t be missed. These unexplored landscapes deserve to be discovered – make sure you do so in style with fabulous fashion finds from La Roca Village. Our intrepid travellers have paved the way, now it’s your turn to explore – take a trip to the south this Easter and discover everything this beautiful area has to offer. Discover other Catalonia secret places here. Tarragona – known as Tárraco during the Roman empire – was one of the most important cities of Roman Hispania and, as a prominent enclave, many imposing structures were built there as a statement of the wealth and power of the region. The amphitheatre is one such building, and is one of the best conserved vestiges of the Roman empire in the Iberian peninsula. Influencer Berta Prats discovered the charm of this monument which, together with other imperial buildings in the city and its surroundings, is part of the archaeological ensemble of Tárraco, now a UNESCO World Heritage Site. While exploring the amphitheatre, Berta dressed in an outfit from La Roca Village, adding a stylish twist to her adventure. The majority of Catalan protected designation of origin wine comes from the south of this territory, including Priorat, Montsant, Terra Alta, Tarragona and Conca de Barberà. So it’s not surprising that the landscape of these areas is covered with vast expanses of vineyards, painting the countryside in a rainbow of purple, greens and orange hues, depending on the time of year. It’s the perfect place to enjoy a relaxed stroll and see the vines at all their different stages: from the first buds, to the harvest and flowering. Refined wines deserve refined looks – discover everything you need for an elegant day of exploring at La Roca Village. Just 15 minutes from the town of Poboleda, nestled between country roads, vineyards and the Montsant mountain range, is a 17th century farmhouse named Mas Sinén which is home to the Burgos Porta winery, where Priorat DOQ (Catalan denomination of origin) organic wines are produced. 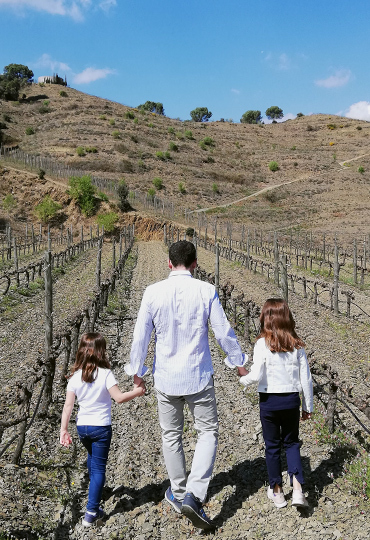 Visitors are shown around by the winery’s charming owner, Salvador Burgos, along with his wife, who introduce the uninitiated to the processes required to produce their exquisite wines. From the grape harvest to the boots worn and, of course, the wine tasting on the upper floor of the farmhouse – when you visit you’ll have the chance to discover all the secrets to their success. Not sure what to wear while exploring? Opt for comfortable chic.